The Facebook post was short, as they usually are. Just a quick rant lamenting the fact that changing a few words in a document doesn’t make you a writer. It went by so quickly, buried amongst the comments on what’s for dinner and the latest cat video, that it would have been easy to miss. I didn’t comment. I didn’t “like” it. I just paused as the words gnawed at a place in the pit of my stomach – the place that reminds me that I am a writer. I had been writing professionally for close to a decade when that post caught my eye, yet nearly every day I questioned my right to do so. When supervisors or clients callously said, “Why did you choose that word?” or, “I would have used ‘and’ instead of ‘also’.” Or, anything. If they said anything in response to my writing, I felt pain. You could criticize what I was wearing. Tell me I’m ugly. Insult my intellect. Sure, I’d be mad, but, I wouldn’t believe you. I trust my fashion sense and God-given brains. What I didn’t trust is my right to write. I’m not alone. My Facebook friend confirmed it. In the world of communications, there is a constant battle taking place – one in which everyone seems to want to be a writer. That is everyone except for most writers. Self-doubt is so rampant in the writing world that entire blogs, communities, and books have cropped up on the topic. For many years, I was unaware. I thought I was alone. I kept my head down and just kept writing, gritting my teeth, telling myself that I just needed thicker skin. I have been a dietitian since 1997 after completing a four-year nutrition degree and dietetic internship. I really only dabble in nutrition counseling now, yet I have never had to justify calling myself a dietitian. Calling myself a writer however is fraught with difficulty. I suppose it makes sense. All art has an air of subjectivity to it. It doesn’t matter that I have written hundreds, maybe even thousands of pieces, and been published widely online and in print. Somehow calling myself a “writer” seems to be as brazen as calling myself a deity or a beauty queen. The room for doubt is wide open. Even in a group of sensitive artists, my writing skills were under attack. The newsletter I wrote was the primary source of sales for my small employer. I knew that. I also knew that marketing writing (copywriting) for the web is some of the most challenging and creative writing there is. Yet, I didn’t defend myself. I didn’t explain that I too was creative. That everyone is! You win some. You lose some. What one person thinks is brilliant, another thinks is bland. To think that I can ever please everyone with my writing or even with what I call myself is absurd. So, I give up! Or, at least I try. I have left jobs, ended contracts, abandoned half-finished books and articles because I am consumed by doubt and plagued by the voices of the unwieldy critics. But, a truth keeps arising. The critics who sneer or respond negatively – the ones who are compelled to change a few words, to muddle with my thoughts – they want to write. They want what I have. They wish they were brave enough to put themselves out there. The opposite of love is indifference. If they have enough interest in me and my writing to dislike it, to question it, then I may just be doing something right. At some point you have to just say without apology, “this is who I am.” This is what I do. This is how I express myself. The written word has power that supports a shy introvert like me. 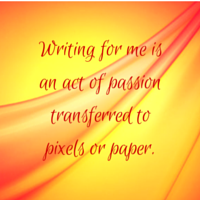 Writing for me is an act of passion transferred to pixels or paper. I just can’t stop! It will never be comfortable. It will never be easy. But, I simply must write. I reclaim my right to do so. Thanks for the encouragement Debra :)! I loved your entry! Great job. Thanks Bryan! So glad to have the opportunity to express this side of myself.